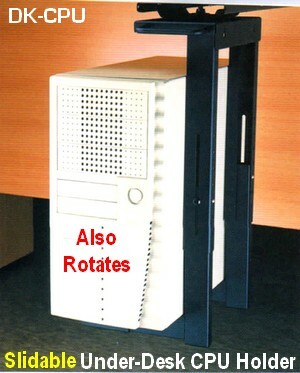 Securely attach your computer CPU tower unit under any table or desk with the sufficient clearance. Save valuable space on your desk or clear-up your floor space, facilitating floor maintenance. 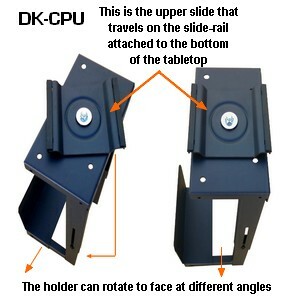 With the DK-CPU commercial grade CPU pull-out holder, you can easily access your computer's wiring by simply pulling out your CPU with the pull-out handle shown above. For specific applications, you can even rotate the CPU holder changing the direction where the CPU is facing. 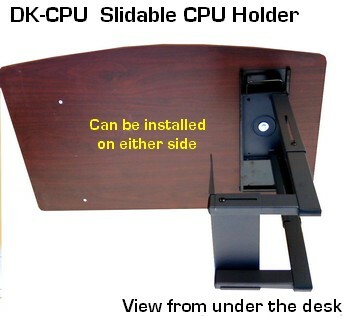 When there is no desk panel next to the CPU, it can rotate 360 degrees. 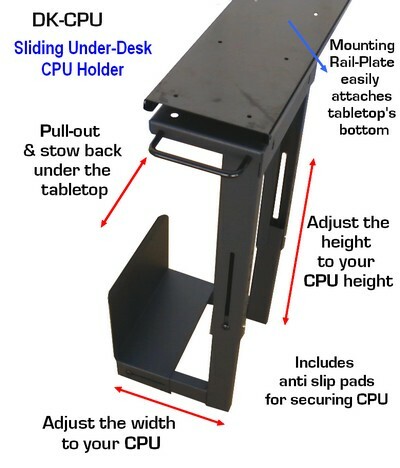 The CPU holder platform can be mounted on either side. Assembly is a matter of minutes: simply attach the rail support plate to the bottom of your desk. Then put together the few CPU platform parts, adapt the width and height to your CPU, add the anti-skid pads, and slide the unit onto the rails. - Maximum height for CPU tower: 19"
- Width range for CPU: from 6.5" to 9"
- Height of CPU support wall: 7"
- Total height of platform when fully extended: 23"
* Tip: Please check out our new DK-KB Ergonomic add-on ergonomic keyboard shelf with mouse tray , and convert any table in a great computer desk combining the above 2 items, plus a LCD Desk stand.